There's a report from Chessbase by WGM Anastasiya Karlovich with, as always for Chessbase, lots of photographs including several lovely female players. Here's the website for the Women's Championship, in Turkish. Sorry, I can't read it! 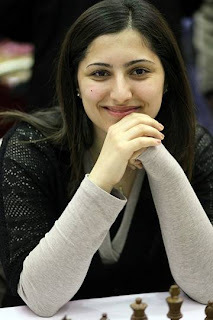 Turkey continues showing its growing support of chess, and especially of women's chess, by having impressive prize funds in both the men and women sections. The Turkish Chess Federation together with the general sponsor, Is Bank, have provided a prize fund of roughly €12,500 in the men's tournament. The women's event is being sponsored again by Arzum Small Home Appliances Company, who has been generous towards this event since 2009. Arzum has provided about TL 45,000 – which is roughly €20,000. The prizes include products (around €4300) as well as monetary prizes (around €7500). On top of that more than 20 of the women players received free accommodation in the 5-star Limra Hotel from this sponsorship. The event was held January 29 - February 3, 2012.